What Are the Symptoms and Signs of Tendinitis? Are There Home Remedies for Tendinitis? What Is the Treatment for Tendinitis? What Are the Medications for Tendinitis? What Is the Follow-up for Tendinitis? How Do You Prevent Tendinitis? What Is the Prognosis for Tendinitis? Tendons are cords of tough, fibrous connective tissue that attach muscles to bones. Tendinitis is an inflammation of the tendon. The condition may also involve the tendon sheath, usually close to where the tendon joins the muscle. Tendinitis is also informally spelled tendonitis. Tendons are generally healthy structures that appear glistening white to the naked eye. If you've ever carved a turkey, the tendons are the tough bands you cut through to get the bones and the muscles of the drumsticks apart. The most common cause of tendinitis is overuse and repetitive motion from recreational, athletic, or occupational activities. Risk factors for tendonitis include repetitive movement, trauma, thermal injury to the tendon, use of certain antibiotics (such as levofloxacin and ciprofloxacin), and smoking. Tendinitis can also occur in people with diseases such as rheumatoid arthritis, obesity, and diabetes. Medial epicondylitis (golfer's elbow, baseball elbow, suitcase elbow) is caused by inflammation of the tendons that attach to the medial epicondyle of the elbow. If you put your arms to your side with the palms facing forward, the medial epicondyle is the bony part of the elbow nearest to your body. Repetitive movements involving forceful wrist flexion and rotation can cause this elbow tendinitis. Lateral epicondylitis (tennis elbow) is caused by inflammation of the tendons that attach to the lateral epicondyle of the elbow. If you put your arms to your side with the palms facing forward, the lateral epicondyle is the bony part of the elbow farthest away from your body. Repetitive movements involving extension and rotation of the wrist can cause this elbow tendinitis. Rotator cuff tendinitis (swimmer's shoulder, tennis shoulder, pitcher's shoulder) is caused by sports that require movement of the arm over the head repeatedly. This repetitive motion causes inflammation on the rotator cuff, a group of muscles that control shoulder rotation. The supraspinatus, infraspinatus, teres minor, and subscapularis tendons form the rotator cuff tendons. Calcific tendinitis is caused by calcium deposits in the rotator cuff tendons. Bicipital tendinitis is inflammation of the tendon that attaches the biceps muscle (located in the front of the arm) to the shoulder. Wear and tear over time or overuse are common causes of bicipital tendinitis. Patellar tendinitis (jumper's knee) is inflammation of the patellar tendon that attaches the kneecap to the tibia. Patellar tendinitis is caused by repetitive jumping, running, or cutting movements. Popliteus tendinitis is a form of tendinitis behind the knee caused by downhill running or walking. Achilles tendinitis is caused by downhill running, jumping, or other activities that can strain the calf muscles. Peroneal tendinitis is inflammation of the tendon that is located in the side of the ankle and foot. Excessive hiking, tennis, or many other activities may cause peroneal tendinitis. De Quervain's tenosynovitis is a painful inflammation of the tendons on the thumb side of the wrist. De Quervain's tenosynovitis is caused by repetitive movements of the wrist and hand, such as lifting up young children from under their armpits. Tendinitis causes pain over the affected tendon. The pain is usually worsened with repetitive motion, but it can also be present at rest. There can also be mild swelling over the tendon. infectious tenosynovitis (infection of the tendon sheath). worsening symptoms without relief with treatment at home. Diagnosis is usually made based on the way the affected tendon and movement of the associated muscle feels. The doctor may have you do the following movements to check for pain and tenderness. Medial epicondylitis: The forearm is placed in supine position (with the palm facing upward), and the fist is flexed against resistance while the forearm is held down. Tenderness is felt on the inner side of the elbow where the bony medial epicondyle is located. Lateral epicondylitis: The forearm is placed in prone position (with the palm facing downward) on the table, while the forearm is held in place. You try to extend your wrist against resistance. Tenderness is felt along the top of the outer elbow near the bony lateral epicondyle. Supraspinatus: Bend the arm to 90° and place it forward 30° with the thumb pointed down. Pain or weakness against resistance can be felt if there is involvement of this tendon. Infraspinatus and teres minor: With your arm against your body with elbow bent at 90°, the doctor will stabilize the elbow against your waist and have you externally rotate (move your arm outward) against resistance, which will bring on pain if these tendons are involved. Subscapularis: With your arm against your body and the elbow bent at 90°, while stabilizing the elbow, the doctor will have you internally rotate your arm inward around the front of your body against resistance, which will cause pain if this tendon is involved. Patellar tendinitis: Tenderness can be felt over the patellar tendon at the lower part of the kneecap. Popliteus tendinitis: Sit with the side of your injured heel resting on the knee of the opposite leg. Tenderness can be felt on the side of the knee. 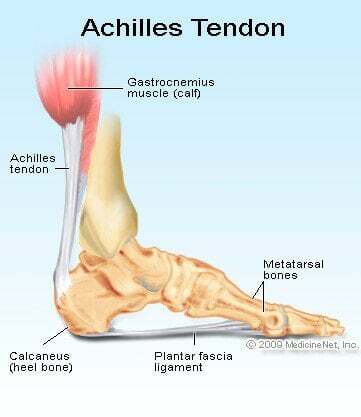 Achilles tendinitis: Tenderness is felt when the Achilles tendon is squeezed between the fingers. Peroneal tendonitis: Tenderness is felt when the peroneal tendon (located on the side of the ankle) is palpated. De Quervain's tenosynovitis: Pain occurs with the Finkelstein test. The thumb is placed inside the fist. The fist is then bent at the wrist toward the little finger by the examiner. The test is considered positive, or abnormal, if the maneuver is painful. X-rays do not show tendons but may be ordered to exclude other problems with the bones or joints. Ultrasound evaluation of the tendon with real-time machines can give an accurate diagnosis. An MRI can detect tears, partial tears, inflammation, or a tumor. ACT scan may be ordered in order to determine if there is a problem with a bone. Ice the affected area 20 minutes at a time every several hours for at least the first 24-48 hours. Wrap ice in a towel to protect your skin. Your doctor may recommend longer use of ice or a stretching regimen. Elevate and immobilize the affected extremity. Use slings and splints to keep the injured area of shoulders and arms from moving. For other parts of the body, use compression with Ace bandages to reduce swelling. Crutches may be helpful. Begin an exercise program to build muscle strength and range of motion with a physical therapist after the acute phase. Investigational treatments for tendinitis or tendinopathy include prolotherapy, sclerotherapy, acupuncture, and autologous blood injection. The doctor may recommend pain control with nonsteroidal anti-inflammatory drugs you can buy over the counter, such as ibuprofen (Motrin, Advil). If pain is severe, the doctor may give you an injection with steroids. This may help by decreasing pain and inflammation but should not be done more than a few times because steroids weaken the tendon, leaving it vulnerable to rupture (see ruptured tendon). Extracorporeal shockwave therapy has been shown to have good results in calcific tendinitis or other forms of tendinitis. Currently, it is still being studied. Ultrasound therapy is used in some cases, but its effect has not been proven. Its greatest usefulness may be in calcific tendinitis. Rarely, surgery may be necessary for tendinitis that is severe or does not respond to other treatments. Your doctor may give you follow-up instructions with other specialists and physical therapists. Use proper technique during sports or occupational activities. Warm up and decrease overuse and repetitive motion of associated muscles. Stop physical or occupational activity if there is any sign of pain. With treatment and if you follow your doctor's instructions, pain and swelling should go away after a few days without further problems. Recurrences can occur if there is continued overuse, but use of splints, proper technique during exercise, and muscle strengthening exercises can usually help. Rarely, surgery may be needed if there is chronic inflammation causing other complications. Harris, E.D., R.C. Budd, G.S. Firestein, M.C. Genovese, J.S. Sergent, S. Ruddy, and C.B. Sledge. Kelley's Textbook of Rheumatology. 7th Edition. Philadelphia: Elsevier Saunders, 2005. What was the cause, or form, of your tendinitis? What symptoms or signs did you experience with your tendinitis?